The natural tooth implant connected fixed partial denture is subjected to debate. Literature was suggestive of both for and against the connection. The connection of implant to natural tooth has advantages and disadvantages. The intrusion of the teeth, biomechanical mismatch between tooth and implant, and marginal bone loss are associated limitations in implant tooth connection. The reduction in cost, anatomical limitations, and reduced surgical intervention were of suggestive of the connection. 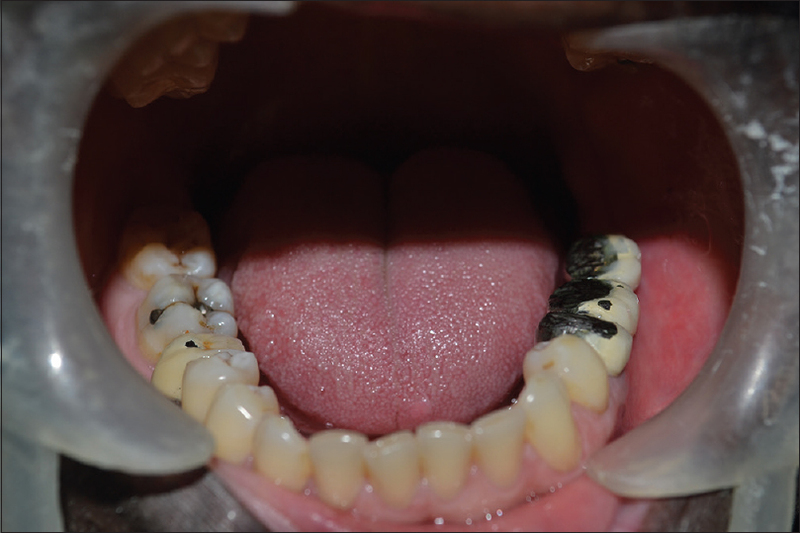 This clinical report was discussed on the 3-year follow-up of the tooth connected implant-supported fixed partial, and the procedures were followed in the fabrication of prosthesis that aided in the success of the restoration. Variable options are available in rehabilitating the partially edentulous patients. The treatment plan varies from a removable denture to fixed denture supported by tooth and implants. With the advancements, the implants have become established treatment option. The implant prosthodontics has evolved significantly with reduced limitations and with relatively no contraindications. The implant and tooth connection is subjected to discussion. Literatures have justified the connection with definitive evidence-based decisions. Few reports have followed the criteria.,, This clinical report followed the established criteria to obtain successful prognosis. A 60-year-old male patient was referred to the Department of Prosthodontics, SRM Dental College, Ramapuram, Chennai, with a chief complaint of the missing teeth. The intraoral examination revealed missing mandibular left second molar (37) and right mandibular first molar (46) [Figure 1]. The treatment options for missing teeth were explained to the patient. The patient consented for implant-supported prosthesis. The patient was explained on the comprehensive dental management of oral hygiene and restoration of caries teeth. The patient consented to the treatment options. The radiograph around 37 and 46 regions displayed good bone support for all the teeth to be used as abutment and adequate bone for implant placement. The surgical placement of implant was done in 37 and 46 regions following delayed loading protocol [Figure 2]. During the healing phase, the patient had a failed endodontic treatment in 36, and the tooth was extracted. The treatment modalities of the teeth replacements were explained to patients. 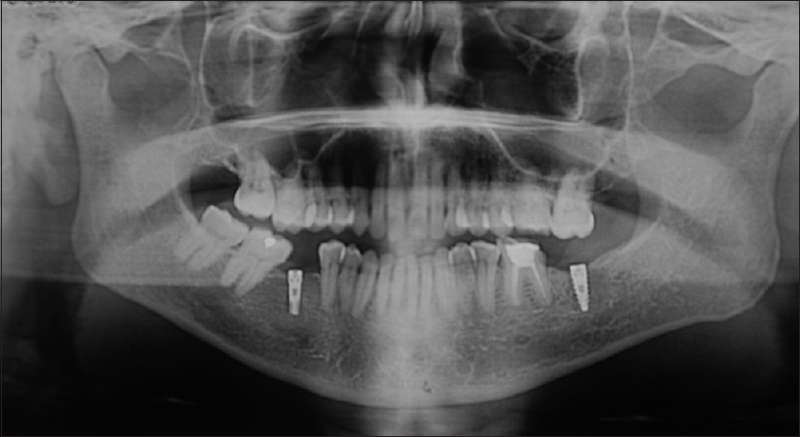 The patient was unwilling for additional implant in the 36 region due to financial constraints. Hence, the clinical scenario resulted with 35 being present, edentulous space in 36 bounded posteriorly by implant in 37. 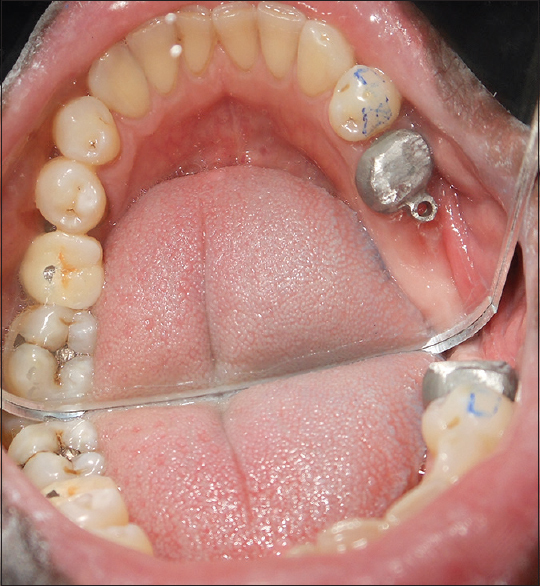 The treatment of the patient with implant-supported fixed partial denture (FPD) with nonrigid connector was decided as the final prosthetic option. The benefits and limitations of the treatment were explained to the patient, and the consent was obtained for the treatment. The patient was instructed on maintenance protocol and periodically reviewed for 3 years [Figure 6], [Figure 7], [Figure 8]. 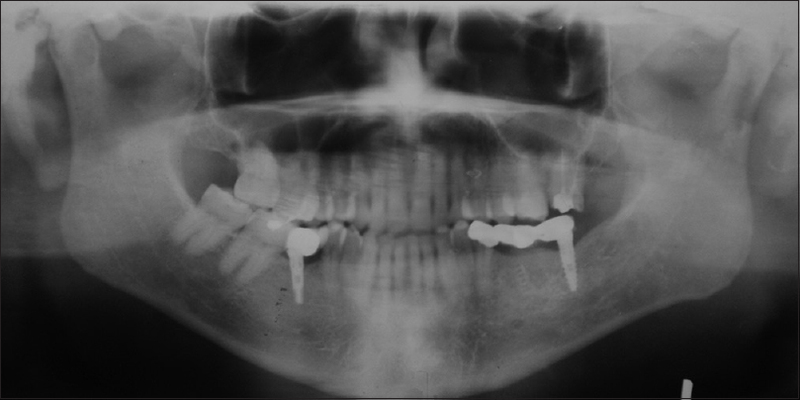 This case report provides a 36-month follow-up with no potential complications either in tooth or implant in a tooth-implant connected FPD. An observation period is continued with and periodic maintenance and surveillance of clinical situation. Pjetursson BE, Brägger U, Lang NP, Zwahlen M. Comparison of survival and complication rates of tooth-supported fixed dental prostheses (FDPs) and implant-supported FDPs and single crowns (SCs). Clin Oral Implants Res 2007;18 Suppl 3:97-113. Akça K, Cehreli MC. Two-year prospective follow-up of implant/tooth-supported versus freestanding implant-supported fixed partial dentures. Int J Periodontics Restorative Dent 2008;28:593-9. 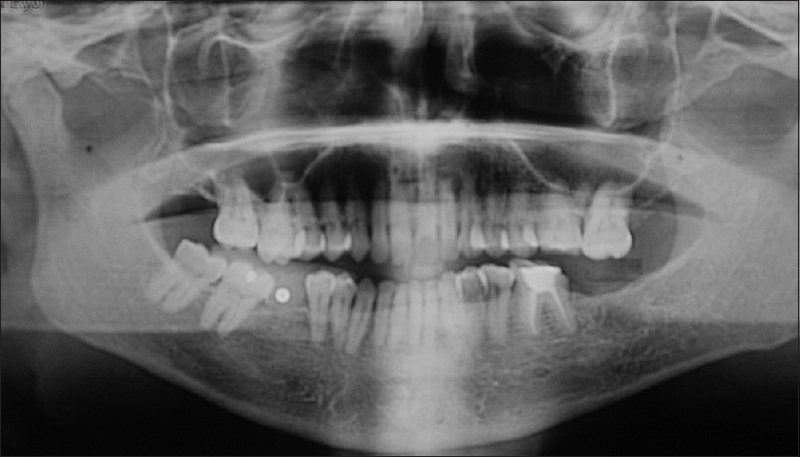 Naert IE, Duyck JA, Hosny MM, Quirynen M, van Steenberghe D. Freestanding and tooth-implant connected prostheses in the treatment of partially edentulous patients part II: An up to 15-years radiographic evaluation. Clin Oral Implants Res 2001;12:245-51. Hosny M, Duyck J, van Steenberghe D, Naert I. Within-subject comparison between connected and nonconnected tooth-to-implant fixed partial prostheses: Up to 14-year follow-up study. Int J Prosthodont 2000;13:340-6. Misch CM, Ismail YH. Finite element stress analysis of tooth-to-implant fixed partial denture designs. J Prosthodont 1993;2:83-92. 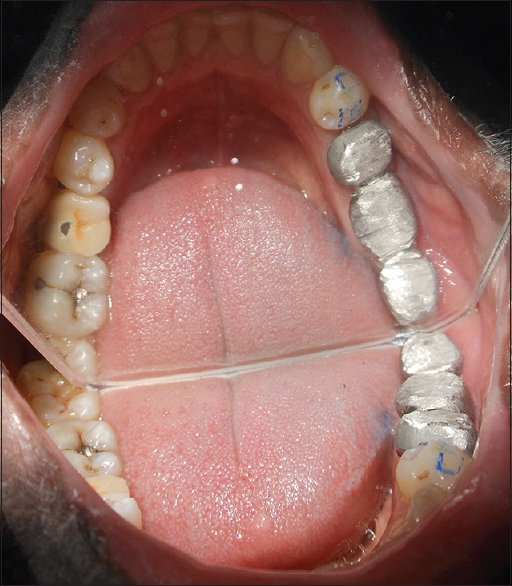 Greenstein G, Cavallaro J, Smith R, Tarnow D. Connecting teeth to implants: A critical review of the literature and presentation of practical guidelines. Compend Contin Educ Dent 2009;30:440-53. Akça K, Uysal S, Cehreli MC. Implant-tooth-supported fixed partial prostheses: Correlations between in vivo occlusal bite forces and marginal bone reactions. Clin Oral Implants Res 2006;17:331-6. Lindh T, Dahlgren S, Gunnarsson K, Josefsson T, Nilson H, Wilhelmsson P, et al. Tooth-implant supported fixed prostheses: A retrospective multicenter study. Int J Prosthodont 2001;14:321-8. Chee WW, Mordohai N. Tooth-to-implant connection: A systematic review of the literature and a case report utilizing a new connection design. Clin Implant Dent Relat Res 2010;12:122-33.